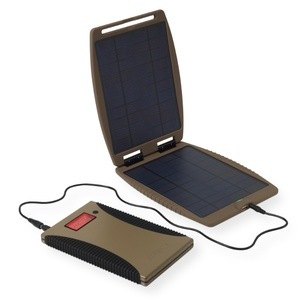 Tap into an unlimited source of power with the PowerGorilla and SolarGorilla Tactical Solar Recharger Kit. Featuring a rugged and water resistant solar panel that can efficiently convert sunlight into solar energy and supply it to an array of devices. Now paired with the PowerGorilla Tactical Battery Backup Charger, giving the user an unlimited and sustainable power supply. Great for recharging laptops, phones, tablets, GPS, digital cameras and so much more!